There will come a time, when ‘traveling’ will enter your mind. It can get you places to places, experience a complete new culture, meet different kinds of people and eat the most extraordinary foods in town. But, it’s not only the adventure that always matters, it’s actually the places you stay that will make your trip more fruitful. Hotels are one of the most important aspect for travelers and tourists around the globe. Its accommodation provides safety and security when travelers are away from their home. Thus, accommodation can make a huge difference, so, choosing a hotel can greatly change how you write the story of your little journey. And that’s why TripAdvisor releases its Top Hotels annually. It helps the travelers decide which hotels are worthwhile. TripAdvisor’s ranking is based on the quality which refers to the bubble ratings given by the travelers themselves; the recency which refers to the most recent reviews of the customers; and the quantity which refers to the number of reviews that respond to the service of a hotel. La Siesta hotel is one of the most recent hotel of Elegance Hospitality Group (EHG) which is located in Hanoi, Vietnam. Its interior captures the modern, edgy style with its incorporation of metal, glass, wood and modern steel greys and bluish blend that gives a contemporary feel when you’re inside the hotel. It can accommodate guests with its 70 guestrooms over its 11-storey high hotel. Beyond that, with its traditional Vietnamese hospitality, La Siesta hotel is also known for its outstanding customer service. 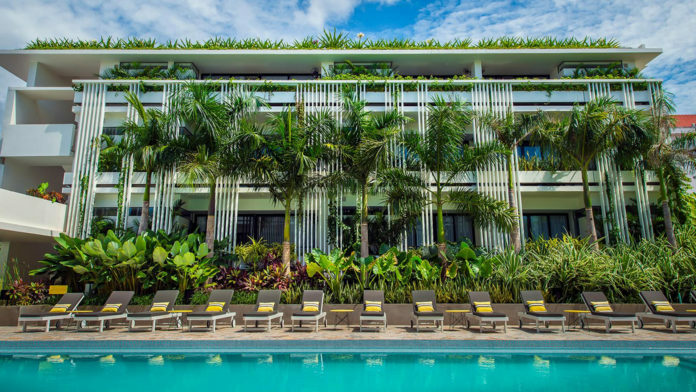 Because of this, La Siesta is not only one of the Top Hotels in the world, but it is also recognized a one of the best-service hotels in Vietnam and one of the top hotels in Asia and in Vietnam itself. So, if you’re looking for a place to stay, Vietnam isn’t too far away. There’s a reason why Nayara Springs is included as one of the top hotels in the world. Among those is that, Nayara Springs is known for its peculiarity for its hotel is surrounded by emerald forests, tropical gardens and unspoiled hills. But, the magic happens when you see the breathtaking landscape of Arenal Volcano, one of the youngest and active volcanoes in Costa Rica. Nayara Springs being situated closely to nature, the hotel also offers amazing adventure such as Ziplining, Water Rafting, Canyoning and other related activities. Its secluded property offers exclusive service and amenities to travelers who wish to experience peace and privacy. There’s so much more to Paris than just being the romantic city in the world. La Reserve Paris is a 5-star luxury hotel situated near the Eiffel Tower. It only has 40 rooms but it’s numbers are made for a special reason. It’s these few mansion-styled rooms that makes your stay infinitely intimate. The rooms are inspired from the 19th century Parisian monarch society which gives the guests a spacious, private, luxurious atmosphere. Plus most are with views of the Eiffel Tower and Grand Palais. Whether for honeymoons, anniversaries or just for a romantic break, hotels are best known to cater couples who wants an intimate space. Little did you know that there are also hotels that widely serves families, one of which is Nantucket Hotel and Resort situated in Nantucket, Massachusetts. If you’re game for a family-get-away, Nantucket hotel offers a wide-range of family-friendly and children-friendly activities that both parents and children will surely enjoy. To name some, Nantucket Hotel can let you experience the Children’s Day and Evening Programs, The Nantucket Club, Children’s Beach and Jetties Beach, Nantucket Whaling Museum, and the Dreamland Theater. However, if you’d want to explore the outer atmosphere of the hotel, you’ll find a variety of options just along the way to hotel. Good thing it is located at the center of downtown Nantucket—not to mention its distance to the Brant Point Lighthouse. In Italy, it’s never difficult to find a paradise— but what’s difficult is to seek for a paradise that offers not only sights but also a beautiful ride. Hotel Belvedere in Riccione, Italy is known as a ‘bike hotel.’ Perfect for those aspiring cyclists— Hotel Belvedere will let you enjoy its accommodation and your passion at the same time. It offers different cycling activities where guests are guided by professional cyclists that will tour you around the vicinity. Also, being located close to the shores of the Adriatic, the sand and sea blends just as right to set a beacon to every visitor in Hotel Belvedere. This is how most travelers describe Gili Lankanfushi Resort located on the private island of Lankanfushi in the North Malé Atoll of Maldives. Despite being isolated in an island, Gili resort ensures that their people are equipped in responding to the customer’s needs. Maldives is recognized because of its most beautiful fine beaches, pristine clear lagoons, amazing underwater wildlife but most importantly because of its breathtaking villas seated over the large bodies of water. While this seems to be usual, it’s hard to notice which resort offers a unique feature. It may sound odd but Gili resort was once recognized as one of the most spectacular hotel bathrooms in the world. Its bathrooms feature an open-air walkway leading to a separate open-air shower with its own private water. La Siesta Hotel and Spa is just a part of La Siesta Trendy’s special offer and services. It is recognized for its wellness spa and trusted as a place to unwind, relax and regain energy. La Siesta offers many featured offers and packages where you can spend some pampering time. With its six treatment rooms, it can cover a wide-range of therapies such as sauna and herbal baths. Traveling through the time of the Indian dynasty is no accident. Umaid Bhawan Palace, a marvel built by Maharaja Umaid Singh, is the youngest palace of India. But, it is also one of the largest private residence in the world. From its exterior to its interior, the palace is entirely made with marbles and the likes. With its original but dull architecture, you could enjoy the actual location that has enjoyed by some actual royal company. Furthermore, Umaid Bhawan Palace being situated on Chittar Hill, (the highest point in Jodphur) also entails mysterious, interesting stories that are hidden in the premises of the monument. If you’d want to know— a little secret hunting might be exciting. As the saying goes, “there is no place like home.” But in the heart of Manuel Antonio, Costa Rica, you might be able to find a place you could ‘home.’ Tulemar Bungalows and Villas is visited by a lot of tourists certainly for one reason— its private self-contained bungalows and villas. Whether you’re staying in a luxurious villa or in a budget-friendly bungalow, you will still have access to the wide selection of its service and amenities. Situated near Manuel Antonio National Park, Tulemar Bungalows and Villas encompasses Costa Rica’s central Pacific coast, white-sand beaches, dense rainforest and coral reefs. So, expect a wide-range options of jungle and water adventure that you and your family will definitely enjoy. ATLAST! Hitting the number one spot this year is the pride and honor of Cambodia, the Viroth’s Hotel. Being located on the map of Asia where it is closely near to every part of the globe, you’re not too far from experiencing the best hotel in the world. Situated at the center of Siam Reap, Viroth’s hotel location is just near the town where you can enjoy other restaurants and shopping malls. Its top features are the large-pool and spa surrounded by tropical leafy trees giving you a nature vibe while you’re enjoying your dive. Its interior offers you some sleek mid-century sights with lush planted areas blending with the warm forestry colors that adds peace and comfort to the hotel. But, if you think that expensive luxurious hotels always hit the top, the best thing about this is that— Viroth’s hotel also stands for its title as one of the most affordable luxury hotel that you could ever experience this 2018.